Our theatres ticket prices vary based on market or territory. You can visit your local theatre to find their specific pricing policy. To locate pricing information on our website, please select your theatre under the ‘locations’ tab on the top section of the page. Then, scroll down to the theatre you plan to visit, and click on the theatre name. At that point, locate the movie you are inquiring about and click on a showtime. The page that is presented will provide you with pricing information, as well as student and military discount availability. We do offer special pricing, discounted days, and special promotions for students and military members. These offers are not available at all times at all locations. Sign up for your location’s newsletter and stay connected on these special promotions! Do you have matinees? If so when and is there a special matinee price? Yes! Matinee pricing is available for shows beginning before 4:00pm. How far in advance can I purchase a movie ticket? Tickets can be purchased by Tuesday night for the following Friday. However, most movies have advanced sales as early as 4 weeks before it’s released. Do you have accommodations to assist moviegoers with vision and hearing impairments? Absolutely! All of our theatres are equipped with assistive listening and closed caption devices. Also, every Monday evening, we feature a special presentation in Open Caption. Could you explain the current rating system? 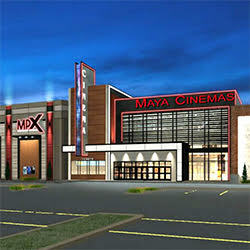 Maya Cinemas fully supports the MPAA ratings system. No, the system is not designed to serve the function of "critic." The ratings do not determine or reflect whether a film is "good" or "bad." The system is not intended to approve, disapprove or censor any film; it merely assigns a rating for guidance--leaving the decision-making responsibilities to the parents. Our theatres open 30 minutes before the first show starts. Local Management may at their discretion, open earlier when deemed appropriate. Our theatres close 30 minutes after the last show has started. Do you have special pricing for large groups? Do you rent your cinemas for private screenings? Do you have a Birthday Party program? If I purchase tickets online is there a surcharge? If I can’t print my online tickets what are my options? You can bring your confirmation number to the box office or the credit card you paid with.